I recently took a look at Zend Server 7, the latest version of the powerful application monitor/manager suite. This quick tip will show you how to get it installed on a Vagrant box so you too can experiment with its features. Make sure you have Virtualbox and Vagrant installed – the newer the better. Clone this repository. Adapted from Homestead Improved and originally Homestead, this setup will boot up a bare-bones Trusty (Ubuntu 14.04 LTS 64bit) VM. After the cloning is complete, boot it with vagrant up. The only real difference from a truly bare bones Trusty box is the fact that weâ€™ve forwarded port 10081 which is what Zend Server uses by default. After the booting is done, enter the VM with vagrant ssh. Once these commands have been executed, Zend Server will be installed and running. If you donâ€™t have Nginx installed (and on the default Trusty box, you donâ€™t), it will pull it in alongside the version of PHP you specify (5.5 in our case). Once installed, you should be able to access the Zend Server interface from your host machineâ€™s browser via http://192.168.10.10:10081. This interface will then let you finish the installation from within the browser. To be able to do read/writes on logs, we need to give the zend user permission to alter the log files, as per instructions. Optionally, deploy a sample application. In this case, letâ€™s go with PhpMyAdmin. In the VM, install MySQL with sudo apt-get install mysql-server. 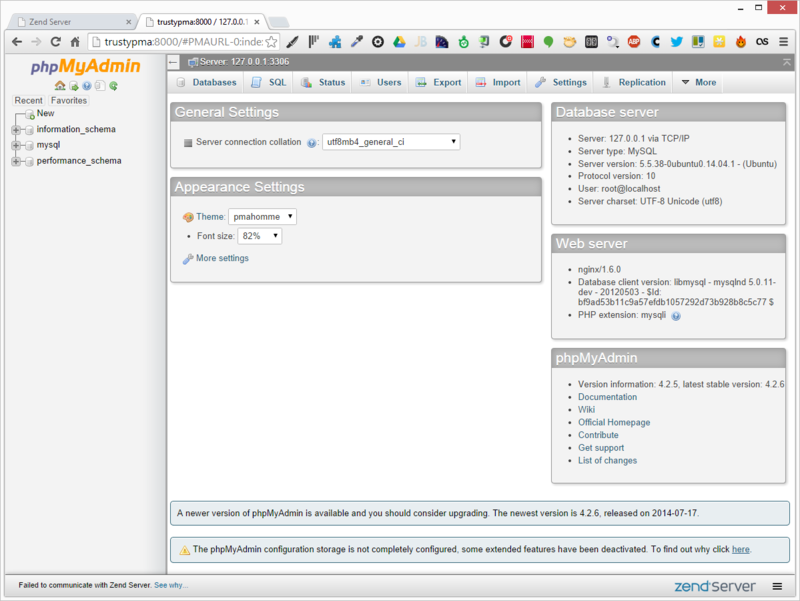 On the main Page Guide screen of the Zend Server GUI (the first page when you click on Overview), click the right arrow under the â€œDeploy Appsâ€� to scroll to PhpMyAdmin. In the Zend Server GUI, walk through the installation wizard of installing PhpMyAdmin (pay attention to the questions about root password), and when asked to give it a default server, add a new one. I used http://trustypma and added it to my hosts file on the host machine, so I can access Zend Serverâ€™s PhpMyAdmin via http://trustypma:8000 from the host browser. Thatâ€™s it! 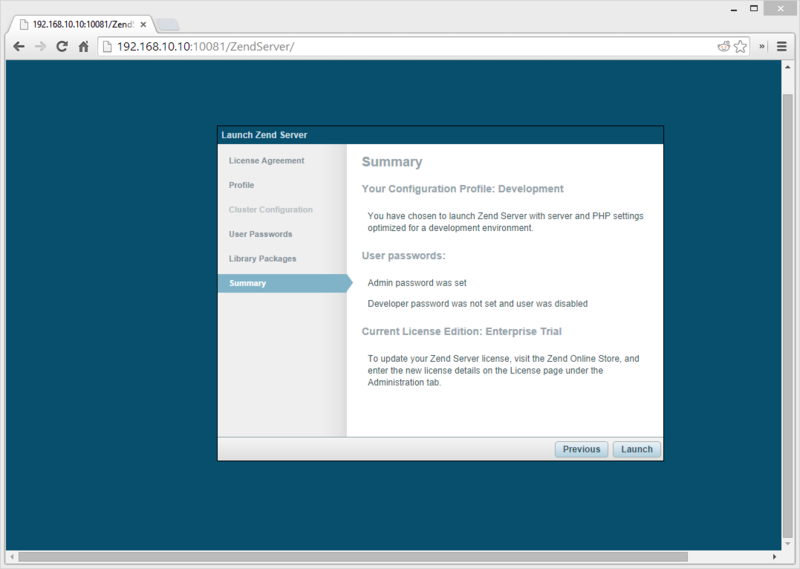 You have a working instance of Zend Server installed, complete with enterprise features.